Miami Dolphins quarterback Ryan Tannehill will miss his fourth straight game on Sunday while recovering from a shoulder injury he suffered in Week 5, providing yet another opportunity for backup quarterback Brock Osweiler to prove himself in the starting role. “I think your mentality in this league is when you get your opportunity to play, you never give that guy his job back,” Osweiler told the South Florida Sun-Sentinel on Wednesday. “And that’s nothing personal against anybody. Since he became the starting quarterback in Tannehill’s absence, Osweiler hasn’t been terrible. All the good feelings earned by the Miami Dolphins for their 3-0 start are now officially and completely gone. The good news for the Dolphins is that the 3-5 New York Jets will visit them on Sunday at Hard Rock Stadium. The Jets have also lost two in a row. 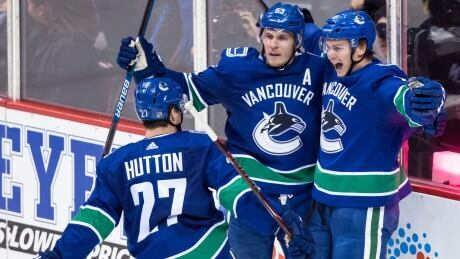 Jake Virtanen scored twice on Wednesday, leading the Vancouver Canucks to a 4-2 win over the Chicago Blackhawks. It was the first two-goal game of the 22-year-old right winger's career. Linebacker Kendell Beckwith was back on the practice field with the Tampa Bay Buccaneers on Wednesday for the first time since an automobile accident in April that left him with an injured ankle. While eligible to return to practice after missing six games, Beckwith was unable to return to practice until Wednesday. Beckwith started nine games and had 73 tackles, a sack, a forced fumble and two passes defended in 16 games for the Buccaneers as a rookie last year. Carolina Panthers head coach Ron Rivera has said he has no issue with safety Eric Reid‘s decision to continuing kneeling during the national anthem as a protest against social injustice. “Very respectfully, he doesn’t have a choice,” Reid said of Rivera’s support, via David Newton of ESPN.com. There&apos;s nothing normal for the Cleveland Browns hosting the Kansas City Chiefs this week after the dismissals of head coach Hue Jackson and offensive coordinator Todd Haley, but interim head coach Gregg Williams finds himself trying to instill some semblance of order and stability for his squad in a time of turmoil. "It&apos;s about what we do here these last weeks now," Williams said. Williams is trying to pull the Browns (2-5-1) out of a three-game skid. 1. Coming off a two-point loss to the unbeaten Rams last Sunday, Green Bay faces another difficult road test when it visits red-hot New England on Sunday night. The Packers were leading in Los Angeles until a Rams field goal with just over two minutes left on the clock. Green Bay’s Ty Montgomery was reportedly instructed by coaches to take a knee on the ensuing kickoff return. Posted in Green Bay Packers, New England Patriots | Comments Off on Packers vs. Patriots Betting Preview: Who Has Edge When Rodgers and Brady Clash? The New Orleans Saints designated wide receiver Tommylee Lewis to return from injured reserve on Wednesday. Lewis was back at practice with the Saints for the first time since injuring his knee in a Week Two game against the Cleveland Browns. Lewis is in his third year with the Saints. You are currently browsing the Sportspool.com Sports News blog archives for October, 2018.